Samsung is a South Korean multinational electronics company that is popular for manufacturing various electronics products. The full range of products includes TVs, washing machines, laptops, refrigerators, computers, mobile phones and much more. Samsung develops different kinds of refrigerators in varying capacities. The 300 litres refrigerators are common among the people with mid-sized family. These refrigerators are usually double door with a freezer on the top and come in different colours. The Samsung fridges are mainly popular for their increased cooling capacity. All the refrigerators are Frost Free type and also come with many other convenience features. If you go through our price list as updated on 23rd April 2019, you can find 68 Samsung 300 litres refrigerators. The shelves in these refrigerators are made of toughened glass which is durable and sturdy. There are also refrigerators that can be operated without any stabiliser. With so many features such as Smart Connect inverter, LED Display, convertible freezer, big bottle guard and much more, these refrigerators are the complete package for small families. 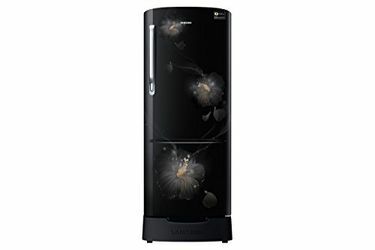 Buy online to get the best deals on these fridges as they are available on various online shopping websites such as Croma, eBay, Tata Cliq, Amazon and much more. If you compare the price of the refrigerators that are available online, you can get your favourite freezers at the lowest price. Although these fridges come with 2-star to 5-star rating, it is better to buy refrigerators with 5-star rating as they are energy efficient.